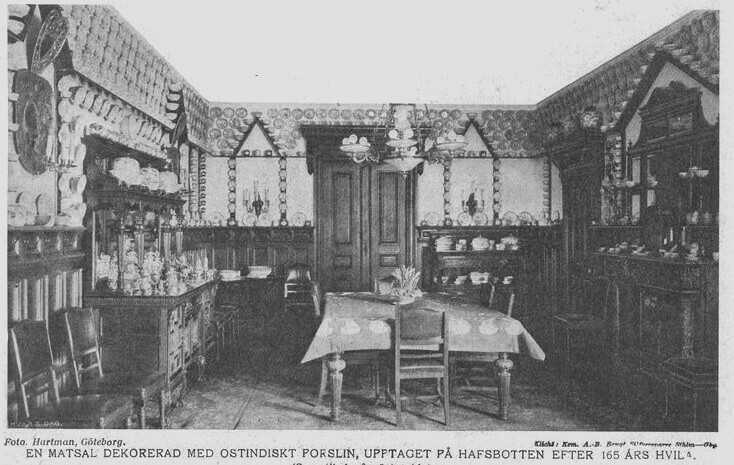 In 1905, James Keiller, a member of one of the distinguished Gothenburg families of Scottish descent, and Carl Lyon, an antique dealer, obtained royal permission to recover porcelain from the wreck of the foundered East Indiaman Gotheborg resting at the bottom of Göta Älv since its foundering in 1745, and to salvage what could possible be left. After this salvage operation that continued for at least the two seasons of 1906 and 1907 nothing of interest or value was felt to remain at the site and the ship was forgotten again. During the summers of 1906-09 the salvage expeditions is said to have recovered around 3,000 undamaged porcelain pieces "within an area 'sized as a football field covered with shards'". The article below speaks of 4,300 pieces. All probably depending on how you count. The finds were all registered and declared for import duties, after which some of the finds was auctioned to the public by the Lyon family, while it appears as James Keiller might have kept a substantial part of which a lot was used for decoration. A large proportion of the recovered pieces seem to have been medium sized fruit dishes in blue and white. Medium sized bowls are common among the finds as is a particular kind of deep dishes with no rim, that can not have been particularly useful on the western European market, that actually looks like over sized teacup dishes. Round lidded bowls with straight sides packed in nests inside each other, from small to large are also as common as hard to explain for their purpose. Teacups and saucers of 'eggshell thinness' are mentioned in early reports from the salvage operation but the full total of undamaged eggshell tea sets might be less than a few dozen. 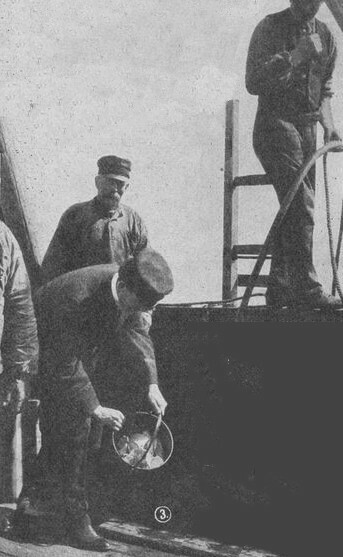 This article from the Swedish magazine Hvar 8 Dag, May 23rd 1909 edition, p. 531 and following, is a detailed contemporary account of James Keiller's and Carl Lyons salvaging of the East Indiaman Götheborg, between 1906-07. It gives an exciting picture of the time of this event and how it was understood and reported in the newpapers. A select number of the illustrations from the original newspaper are given below. Nobody who on Göta Älv for the first time have have passed through the port entrance of Gothenburg and there seen the floating sea mark indicating the so called Göteborgs reef - not far from the Älfsborgs Fortress - have ever failed to try to investigate its meaning, and then learnt that "it was there the East Indiaman sank". Where previous efforts have proved fruitless in their attempts at salvaging its contents, it is now that the true treasures of the East Indian Porcelain have been salvaged from the sand bed grave on which it sat undisturbed for over a hundred and sixty years. No less than 4,300 different pieces were recovered, amongst which were items of full services, that underwent custom's procedures after the 1909 set of Customs tariffs - a procedure that is likely to be unique in the history of the Swedish customs authorities. The items now belong to the individual who salvaged them. The Swedish East India Company got its first Charter the 14th of June 1731. The first charter lasted between 1731-1746, the second ended 1766, the third 1786, the forth 1806 and the fifth 1821 which last charter the company eventually not got the opportunity to fully utilize. Because of all kinds of difficulties they met with, the business became unprofitable and the Company terminated its operations in the year of 1813. In its lifespan, the Swedish East India Company (SEIC) saw no less than 132 expeditions to China whose destination was usually Canton, where each voyage was usually expected to take 18 months. Should these voyages call at Surat city in India, then 30 months was needed. Of all the ships the Company owned, 8 was totally lost. Amongst these, the one which today has our attention is the ship Gotheborg which was under Captain Erik Moreen when it was lost. The reason for this act of violence was that this person whose name was Edvard Rotte - according to the British - was a Spaniard (England was at this time at war with Spain). His luggage had also been brought to land and among this was found 30 bags of money containing 30,000 Spanish piasters. The man was in fact a Frenchman who had a brother, who in Canton was Supracargoe for the French East India Company. And it was to him that the money was to be brought. The Swedish captain protested in vain against such violence. The Company required that the Swedish Majesty should ask for compensation for the damage and cost to the Company this had caused. The ship had been kept in custody by the British for a full month and because of this it had been forced to buy new provisions to the amount of 362,436 re:es. Besides this, it was required, that Rotte and his belongings should be reclaimed. It is not known if any compensation was ever retrieved. The occasion shows eventually how the British by this time used their supremacy at sea. During her third voyage the "Gotheborg" would meet with her final fate. After a long and difficult voyage to Canton she returned to her home harbour the 12 th of Sept. 1745. She was coming in on the Rifö Fjord (next to the Älfsborgs fortress in the Gothenburg port entrance) and was doing good speed, by a brisk fore wind. In all aspects she was a whisk away from the safe harbor of her home. But fate had decided differently. Immediately before the proud ship arrived at Älfsborg, she hit with full force a rock barely concealed by the waves -the so called "Hunnebådan" - immediately outside where we today have the Knippelholmens lighthouse and sank fully-laden, with its valuable cargo. After this the wreck was left untouched for more then a century. The reason was probably the primitive salvaging equipment of the time. Finally in 1864 Mr. James Bourn and in 1877 a Captain Lampa attempted some diving work and succeeded to recover some porcelains, parts of the hull etc. but in no large quantities. In the year 1905 Engineer James Keiller J:r submitted to Commanding Officer a request to receive a permission to salvage the remaining cargo and ship, which was granted. 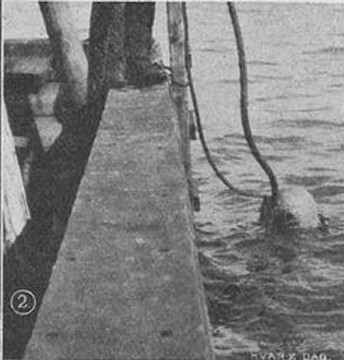 The diving was performed during the summer of 1906 as well as during the summer of 1907. At this time a large amount of complete porcelain pieces was recovered, a large amount of porcelain shards, a number of bars of so called "Tutanego" (a sort of composite metal made up of tin and vismuth) (Ed: during our recent excavation one of these bars was found. Analyze showed it to be pure zinc.) a multitude of Mother of Pearl, a roll of silk, tea and tea boxes and much more. Then was also salvaged all of the remaining wood of the hull, amongst other things the entire aft part of the wooden keel, parts of the anchorage and much more. decorated with some of the salvaged porcelain pieces. Photo: Hward 8 Dag, 1909. This is a careful translation of the 1909 article where I have tried to keep the original flavor of the text. In time I will try to add the remaining pictures that were included in the original printed version of this article.